I love sticky ribs, my family make BBQ spicy ribs quite often, this recipe however, has more Chinese/oriental flavourings. I love sweet and spicy together and of course pork ribs where the meat falls off the bone. It’s Chinese New Year so this is the perfect recipe to share with you this week. I serve it with my Asian noodle salad. 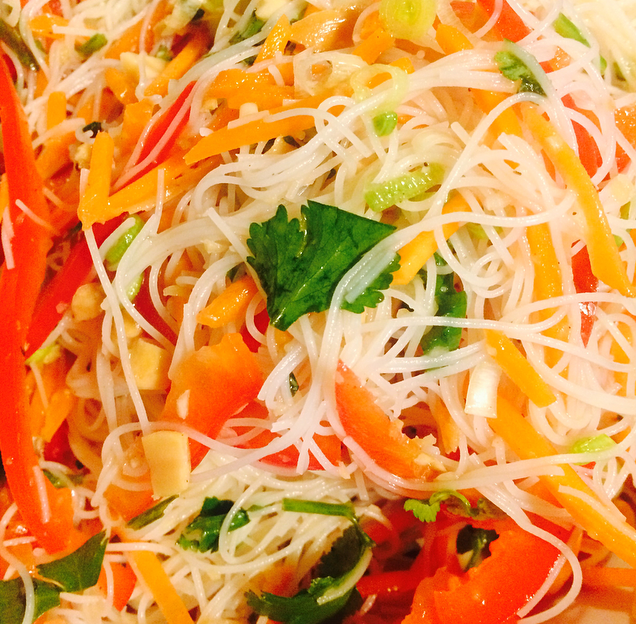 This noodle salad is served cold, and is fairly healthy and very refreshing. Full of colourful vegetables it is a perfect accompaniment to the rich ribs, please find the recipe for the salad below. Pork Ribs, preferably in one piece. I had 1 large piece, with around 14 ribs. Get a good roasting tray and place the meat in, you may need to cut in half as ideally you want them in one layer. Place all of the marinade ingredients into a bowl and mix well, I crushed my star anise, but you can leave these whole and remove later. Taste the marinade, this is important, it should be sweet with a little heat, but make sure there’s enough salt and sweetness. If not add a little more salt or honey. Once the marinade tastes great pour over your ribs and with your hands rub into the meat and turn the meat over to get good coverage. Let this marinate for 2 hours, or if you have time overnight. Place the ribs into the oven, keeping the foil covering the dish. Cook at the highest temperature for 25 minutes then turn the oven down to 170 degrees. After an hour I would check, run a knife through a piece of the meat if it falls from the bone easily it’s ready. If it is still a little tough to cut let it cook for a little longer. Mine took around an hour to be tender. Once tender remove foil and turn heat back up to high cook for a further 25 minutes to get the meat nice and browned. Remove from the oven and carefully take the ribs out of the dish and set aside. Pop the oven tray directly onto the hob and on high let the sauce bubble away and thicken. Once the sauce is rich and thick turn off the heat and pop the ribs back into the tray, coat in the juices and serve. please note I didn’t use the cucumber uin the end but you can add this along with the other veggies. For the dressing smash the garlic with the salt until a forms a paste. Add the ginger, mint, lime juice, 5 spice, rice wine vinegar, fish sauce, sugar, sweet chilli sauce and mix well. Boil the kettle then soak the noodles in the water for 4 minutes. Drain then rinse with cold water to cool the noodles. Add the carrots, spring onion and red pepper to the noodles and the dressing, mix well. I used my hands to mix this. Sprinkle in the nuts and the coriander, reserving a little bit for decoration. Mix well again. Serve with a sprinkling of nuts, coriander, the finely sliced chilli and a couple of lime wedges.